Bring a pot of salted water to a boil. 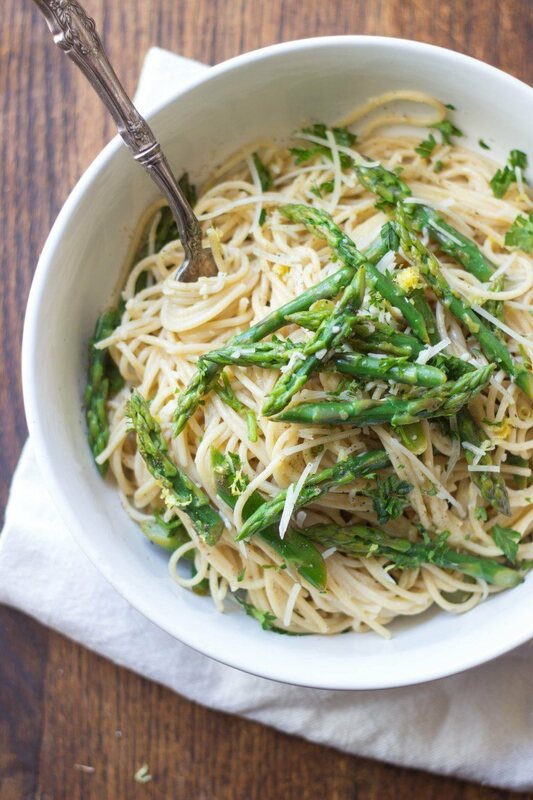 Blanch asparagus for 2-3 minutes. Remove asparagus with a slotted spoon and shock in a large bowl of ice water. Drain and set aside. Add spaghetti to the boiling water and cook according to package directions. Drain spaghetti, reserving about 1 cup pasta water. Set aside. In the same pot, heat ¼ cup olive oil to medium-high. Add garlic and sauté 60-90 seconds, until fragrant. Add lemon zest and juice. Add 1 cup pasta water and bring to a simmer for about a minute, allowing it to slightly thicken. Add spaghetti back into the pot and toss with a generous dash of salt and black pepper. Shut off the heat. Add egg yolks and toss, using tongs. Add ½ cup Parmesan cheese and continue to toss the pasta, until it forms a creamy sauce. Taste and adjust seasonings, if necessary. Add asparagus and toss to combine. Distribute pasta into bowls and top with a drizzle of olive oil, Parmesan cheese and freshly cracked black pepper.